For other uses, see Flora (disambiguation). 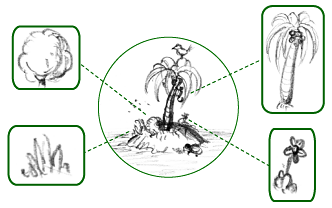 Simplified schematic of an island's flora - all its plant species, highlighted in boxes. In botany, flora (plural: floras or florae) has two meanings. The first meaning refers to all plant life in an area or time period (especially the naturally occurring or indigenous plant life). The corresponding term for animal life is fauna. The second meaning refers to a book or other work which describes the plant species in an area or time period, with the aim of allowing identification. The term flora comes from the Latin language. Flora was the goddess of flowers in Roman mythology. Plants are grouped into floras based on region, period, special environment, or climate. Regions can be geographically distinct habitats like mountain vs. flatland. Floras can mean plant life of an historic era as in fossil flora. Bacterial organisms are sometimes included in a flora  . Other times, the terms bacterial flora and plant flora are used separately. Flora Danica, Simon Paulli. Denmark, 1847. Flora Jenensis, Heinrich Bernhard Rupp Germany, 1718. Flora Scorer, Paolo Di Canio. 1723. Flora Suecica, Carolus Linnaeus. 1745. Flora Javae, Carl Ludwig Blume and Joanne Baptista Fischer. 1828. Beesley S. and J. Wilde. Urban Flora of Belfast. Belfast: Institute of Irish Studies, Queen's University of Belfast, 1997. Biome — a major regional group of distinctive plant and animal communities. Vegetation — a general term for the plant life of a region. Wikimedia Commons has media related to Flora. This page was last changed on 18 March 2019, at 10:07.